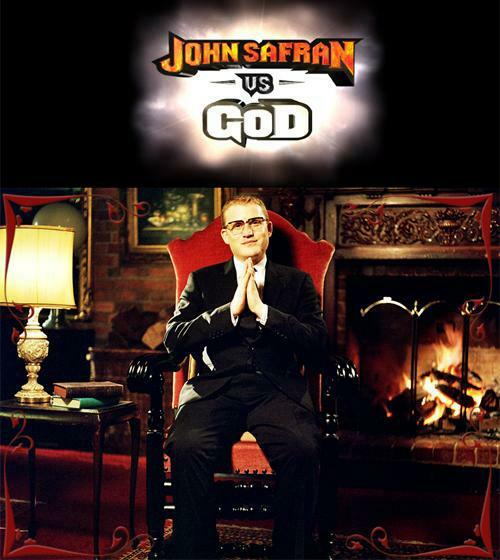 In his most audacious project yet, John set off across the globe to take on religion in his series John Safran Vs God (SBS-TV 2004). He roadtests Buddhism in Japan and Voodooism in Haiti. He door knocks in Utah and tries to convert Mormons to atheism. He tries to convince the Grand Dragon of the KKK to let him join even though he’s Jewish. He travels to the UK to get a Muslim extremist to place a fatwa on an Australian colleague. He auditions for the Harlem Gospel Choir. He is washed in chicken blood in Mozambique. He drinks Native American peyote in Arizona… and vomits. The series builds to the final episode where a Christian exorcist casts out all of John’s demons. In Episode 1, John decides to find out how difficult is it to get a fatwa placed on someone. He travels to the UK Shariah court to find out and chooses an unlikely Australian rival (Rove) as his proposed fatwa-ee. Next John takes a spirit walk in Arizona with the Peyote Way Church of God, and ingests the sacred Peyote drug in an attempt at divine insights into the universe. He also muses about what the most commonly shown programs on Channel 9 would be if Jamie Packer was a practising scientologist? John Safran’s sarcastic yet strangely level-headed approach to the seemingly unending storm that is religious doctrine is hilarious! His comic delivery and unrelenting parodic jousts at religion, without sliding into blatant abuse, is something to be looked up to! Good on you mate, keep bringing the funnies and i’ll keep watching.